I am Henrilynn Ibezim, a graduate of University of Buckingham (2012). After the successful completion of my Bachelors degree, I immediately moved back to Nigeria to contribute my fair share to the greater development of my country particularly in my field of study. In order to practice in Nigeria, every Law graduate must attend the one-year mandatory legal education at the Nigerian Law school and be found fit for admission to the Nigerian Bar. 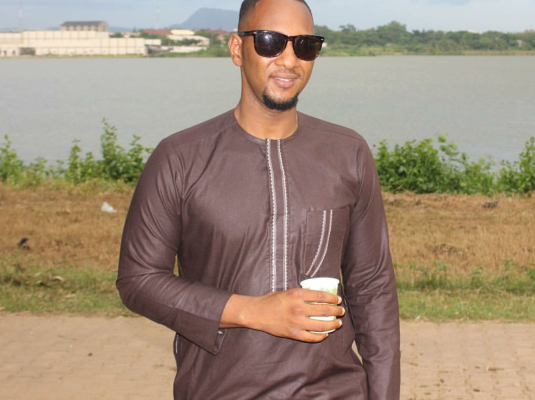 I was admitted into the Nigerian Law School, Bwari, Abuja in 2012, and I was with the 2012/2013 batch with identification number ABJ/1664. 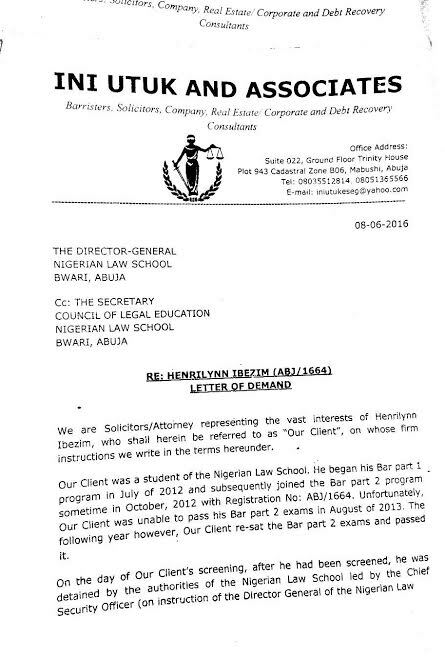 All foreign trained students are also mandated to attend a three months Bar part 1 programme prior to the Bar part 2 programme, so as to familiarize them with the Nigerian legal system after which an exam is conducted and only the successful candidates are thereafter allowed to proceed to the Bar part 2, being the one year legal education programme for all trained lawyers in Nigeria. I passed my Bar Part 1 exam, and proceeded to the Bar 2 program. Unfortunately, due to some family circumstances I did not pass my Bar 2 exam at the first seating, however I was successful on my second seating of the exams in August 2014. On passing the exam, it is procedural for successful candidates to be called for a final screening and clearance exercise being the final prerequisite for admission to the Nigerian Bar and the call to Bar ceremony. I was invited by the authorities of the Nigerian Law School to come for my clearance on Thursday, 20th November, 2014. 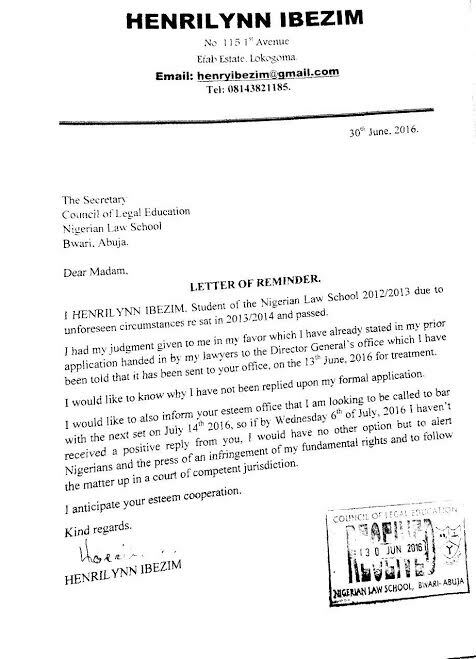 I was cleared by the authorities of The Nigerian Law School and asked to proceed for the Call to Bar Ceremony on the 25th of November, 2014.
and he said he did. He immediately rushed down to the gate where I was with the security officials. He explained to the Chief Security Officer (C.S.O) of the Law School his story affirming that the found envelope containing the invites did belong to him. However, The C.S.O totally ignored him and ordered the Police to arrest both of us while taking the found invites to the Director General. In less than five minutes, the Director General had asked for myself and domestic worker to be transferred to the Bwari Divisional Police Station without any investigation being carried out. I and the domestic worker were transferred to the Divisional Police Station like common criminals where I remained until I was charged to the Magistrate Court in Bwari on Monday, 24th of November 2014. The Divisional Police Officer refused to give me Police bail because he claimed the Director General had personally instructed that I am kept me in his custody. My mother who was then a Controller of Prisons (Now Retired), came down to Abuja dressed in her official regalia, to meet the Director-General, to seek his audience on the situation and enquire how the issue will be resolved. To her greatest dismay the Director General totally embarrassed her in front of his staff and her security detail and told her that I was never going to be Called to the Nigerian Bar for life. It is pertinent to note that I am my mothers only child and she has since this incidence suffered from severe High Blood Pressure. 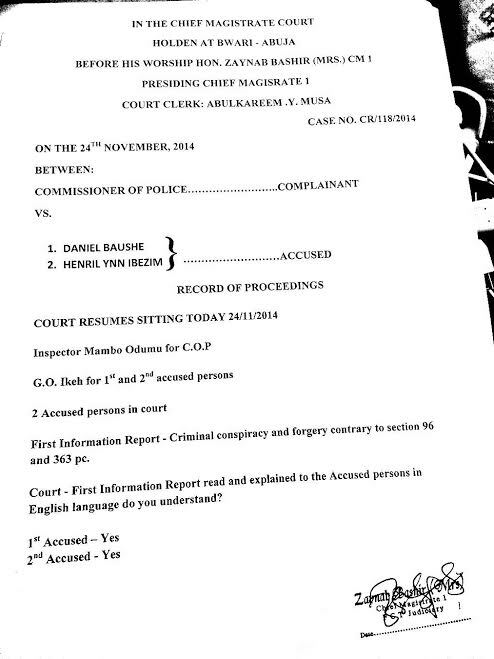 I was eventually granted bail by the Magistrate Court, Bwari on the 24th of November 2014 and the hearing of the case was scheduled for the 4th of December, 2014. My lawyers were unable to meet the bail condition and I was transferred to Suleja Prison that day. 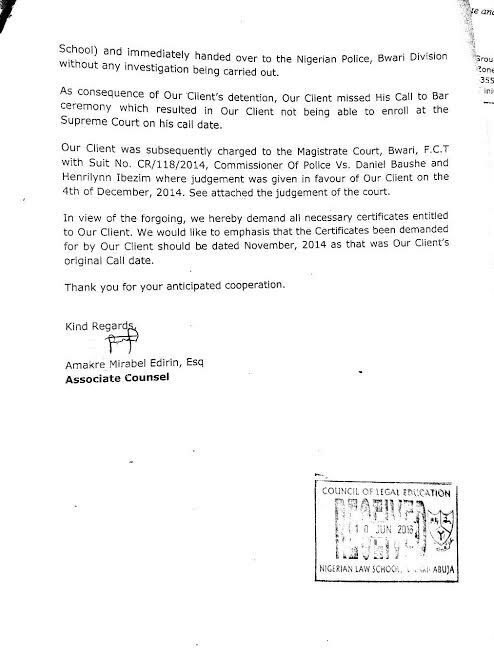 My lawyers fulfilled my bail conditions on the 26th of November 2014. Just before the hearing, the former domestic worker tendered a confession in open court, giving same account which he gave to the C.S.O at the beginning of this sad event. The Judge immediately discharged me and gave a summary Judgement imprisoning the domestic worker (Judgement Proceeding Attached). Subsequently , my lawyers went to the Nigerian Law School to collect my Call to Bar Certificate and were told that I would need to submit my Judgement Proceeding and through the Call to Bar ceremony to get my Certificate. Unfortunately, due to the hiccups in the Nigerian Legal System, I was only able to get my Judgement Proceeding in June, 2016 even though the proceeding is dated 4th, December 2014, being the date the judgement was pronounced. 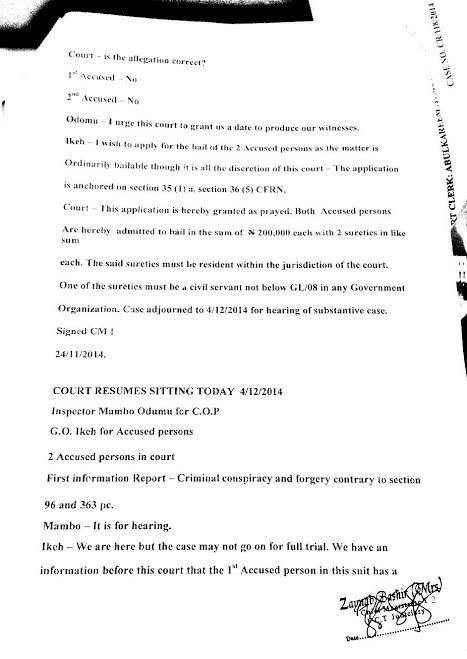 My lawyers applied to the Law School (Application Attached) along with the Judgement Proceeding for me to be called along with the July, 2016 batch, there was however no response to this correspondence. My Lawyer and I then went to the Law school on 30th June, 2016 to see the Director General and The Secretary to the Council of Legal Education, but they both refused to give us audience on claims that they were too busy. The Director Generals Secretary showed us the records showing that our letter was minuted to the Secretary to the Council of Legal Education for treatment. Having been unable to speak to neither the DG nor the Secretary to the Council of Legal Education, I decided to personally write the Secretary to the Council asking for action update while reminding her of my fundamental rights which were being infringed. 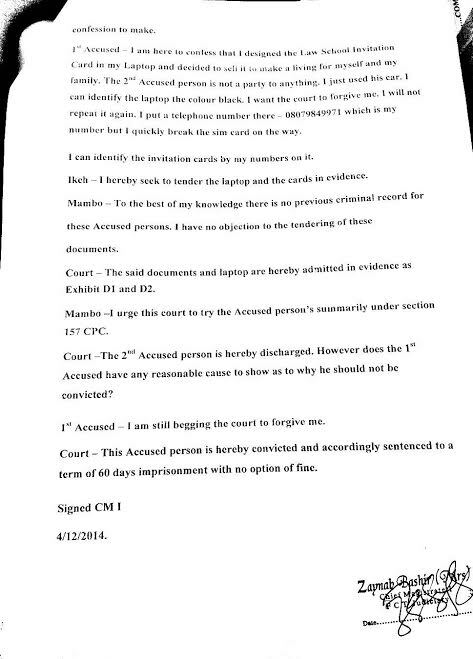 Copy of Letter Attached. This is a cry for help as an ordinary Nigerian whose rights are being infringed upon by legal authorities who ought to uphold justice for all. I am appealing to the National Human Rights Commission to investigate this matter fully and lend me a hand in bringing those that have undermined my rights to Justice. As you are aware sir, injustice anywhere is a threat to justice everywhere. My legal career has been put on hold for all two years as I cannot either further my Legal Education or get a job as I do not have my Call to Bar Certificate. It is very painful and undermining that I have been subject to such inhumane treatment and my dream to speak for justice is slowly being slipped away. I urgently seek your intervention to ensure that this situation is resolved. Thank you for your anticipated assistance. Did you know you can shorten your links with AdFly and get cash from every visitor to your shortened links.